There's always room in our life for the classics, but let's not overlook the here and now. Like FFR, AZLEE debuted in Spring 2015 – so we kind of see ourselves as kindred spirits. And what a debut it was: Already featured in Vogue Paris, W, WWD and Elle France, the brand has attracted the likes of celebrity fans including Rihanna and Zoë Kravitz and scored an Instagram takeover for LoveGold. So what makes California native Baylee Zwart's collection so lust-worthy? We think it's the combination of geometry, sculptural simplicity and kinetic energy that feels very of-the-moment. She keeps it local, producing and hand-finishing everything in her home state, but what we really love is how she supports a different ocean-related cause each season via a portion of proceeds from the sale of her collection. First up: the Marine Mammal Center in Sausalito, CA, that rescues ill, injured and orphaned sea creatures. Thanks, Baylee, for giving us a another reason to justify a purchase! Baylee's hand bedazzled in AZLEE. Say that five times fast. New for fall: The Electric ear wire in full diamonds. We likey. The designer in her own creation. Baylee, we think you should look happier to be wearing something so beautiful! 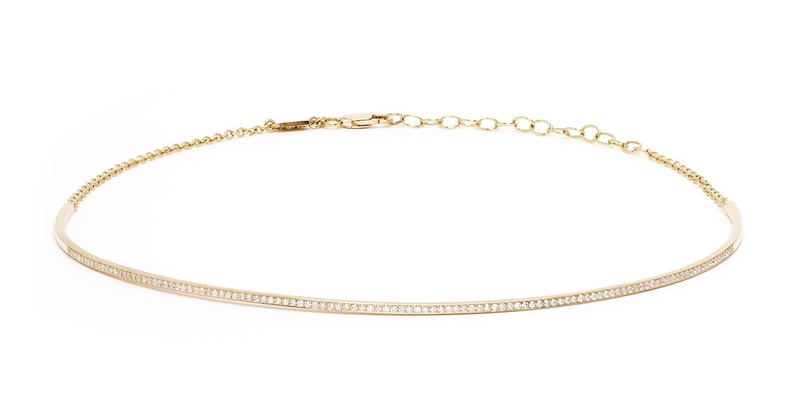 The simple and chic Electric choker in 18K gold and diamonds. Triple Burst ear jacket in 18K yellow gold with sapphire, aquamarine and diamonds, $1,370. Not gonna lie, we kind of want to be this model. Fall 2015 studs in white and yellow 18K gold. Triple burst collar in 18k yellow gold with blue sapphires, aquamarines and white diamonds, $3,840. 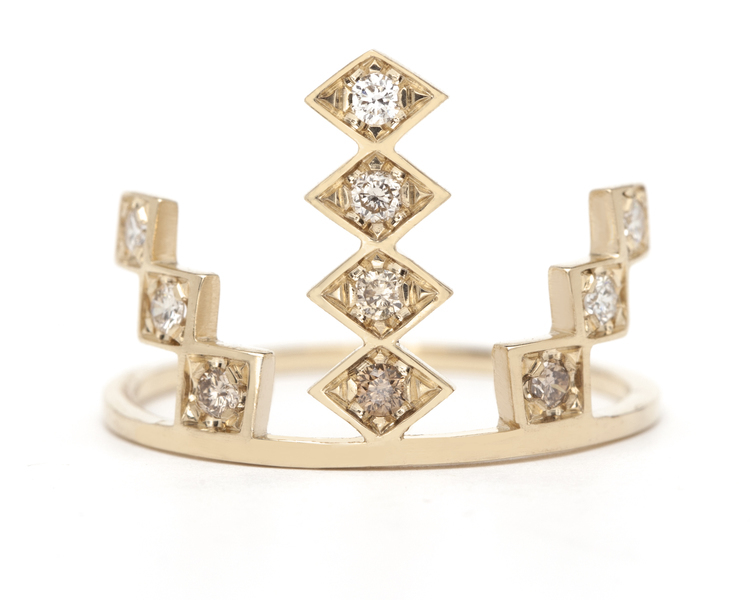 Triple Burst ring in 18K yellow gold, $1,375. AZLEE as found in nature. Backpacking in the middle of nowhere: here's what it looks like. Not too shabby. An Electric moment in Aspen, CO, Baylee's hometown. Remind you of someone's jewelry? I have been designing jewelry for 5 years now. Before then I worked at Allure & Glamour, then moved to Guatemala after that. It was there that I fell madly in love with metalworking and made many of the original pieces that are still included in the collection today. I really admire Monique Pean. Her designs are so sophisticated, and the fact that she has such a focus on using sustainable materials is really inspiring. I love champagne diamonds. All the different shades of them are just so beautiful. I could sit and look at a big pile of champagne diamonds all day! I added a ring to our Spring '16 collection super last minute and it was finished last week. I fell in love with it instantly and it hasn’t left my finger since! I “purchased” it, and need to have another one made asap! I recently got engaged. My fiancée knew I would want to design my own ring (that idea made me so sad though to just design one, then give it to him for him to just give back to me! ), so he actually hand carved a ring for me out of the leg of the couch that we met on (which he also proposed on!). When he proposed he whipped out a wood file to make the ring bigger if need be! I love my hand-made wood engagement ring. I think they really trust the retailer’s quality. I think that is why it is so important to be at the right stores, so customers can have faith and understand the value even when they aren’t purchasing in person. Café Gratitude! It is the most delicious organic vegan food in Venice, CA. They have amazing homemade desserts, and you never know what desserts they will have on any given day since it is at the chef’s discretion based on what he feels like making! Sophisticated sip – Venice Beach Wines, walking distance from my home and such an intimate setting! Alt-J, Glass Animals, Jack Johnson, can’t think of anyone else specifically, but I usually just turn on the Alt-K station on Pandora and I love everything that pops up. I listened to a lot of Alt-J when I designed The Light Collection. Bradley Cooper, I like them smart! Balenciaga Motorcycle bag. It has the perfect length strap to be corss-body or hang from the shoulder. I love these bags. I have a seafoam green one that has been though it all with me. Instagram. I am all about visual imagery, the less words the better. I am still very confused about Twitter. I go on and feel like there is nothing nice to look at! I actually prefer au natural! I hope I never have to do anything else, but I would love to work with animals or work with an ocean-related non-profit. Luckily I get a little taste of that now since we work with a different ocean-related cause each season and each piece sold benefits that cause. Backpacking in the middle of nowhere. It was so cleansing, I could finally think clearly and loved sketching under the trees and had some time to really let my mind wander which is rare. Flats. I have a bit more of a tomboy style, so I love minimalist shoes that are easy to wear. Vince make clean sleek ones that I love and live in. My hometown is Aspen, CO (I am actually here right now!). I love stopping by Nuages. They have such charm and the most beautiful pieces from Alaia to AZLEE! Chequers also has beautiful housewarming gifts. I’ve never really seen Real Houswives, but I think my tagline would be: Be True to Yourself!